Yes I know you can walk the ridge in a day, and I totally could walk it in a day too – but that’s kind of missing the point. I like camping out at the top of mountains – day into night and back again is when they are at the most magic. And I love all the stuff that goes with camping, the eating outside, the sitting on the ground, the watching the sunset, tea with instant milk, poor sleep, being too hot, being too cold, waking up and sticking your head out the door. No really, I love it all. We walked in in the evening – ate our tea at the bottom of the hill then walked up and over to camp at the first bealach. 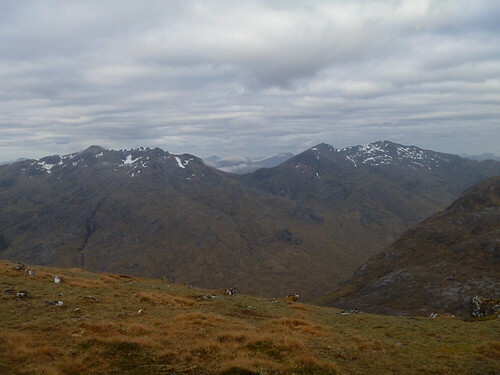 great views across the glen, and to Ben Nevis, and along the ridge. We mined clean snow from a remaining patch, and left it to the air do the work of melting it for our morning cuppa. It’ s hard to turn in and away from the views, but even though we’re up – it’s still a long along to go. Woke up in the middle of the night for a pea, still light and the cloud had closed right in. Turned to look back and couldn’t see the tents at all; just white glowing cloud all around. A little freaked I made a hasty retreat back behind the tent door. Morning. Mountains. A ridge to be walked. walking, stopping at the sound of running water to refill bottles, shouldering packs and walking more. 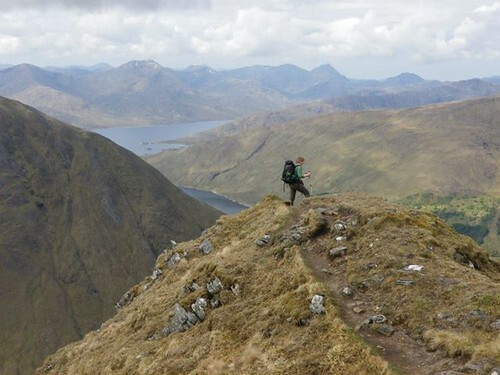 Eating on summits; a hill walking ritual. Not all of the summits; but most. And then we’re there, then end of the ridge. We pitch our tents and brew up as the hill clears of the day trippers. Some of them glad to be going down – but some of them get why we’re staying up here. The next day is to be short, fiona’s got to be on a train south in the evening. We tackle a corbett. It undulates and seems to put up more of a fight than the well trodden ridge. an endearing feature. Then we pack up and head down into the glen. And yeah we could have done it in a day – but why would you want to?